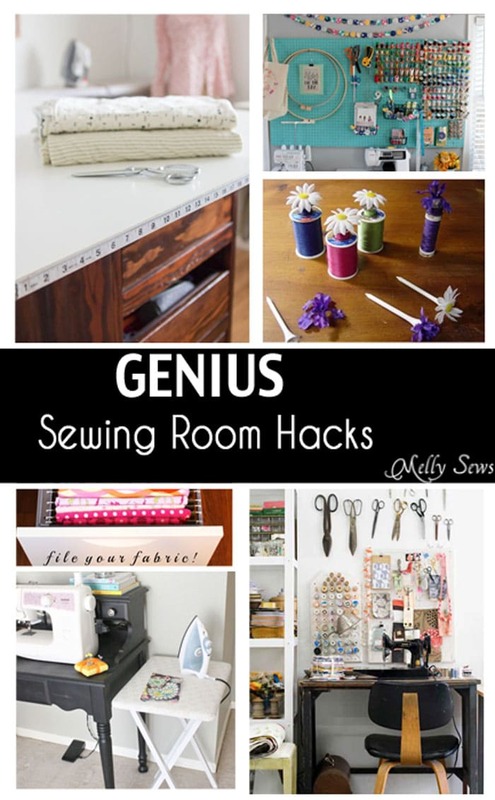 Whether your sewing space is an entire suite or a tiny corner, these hacks can help you make the most of it. 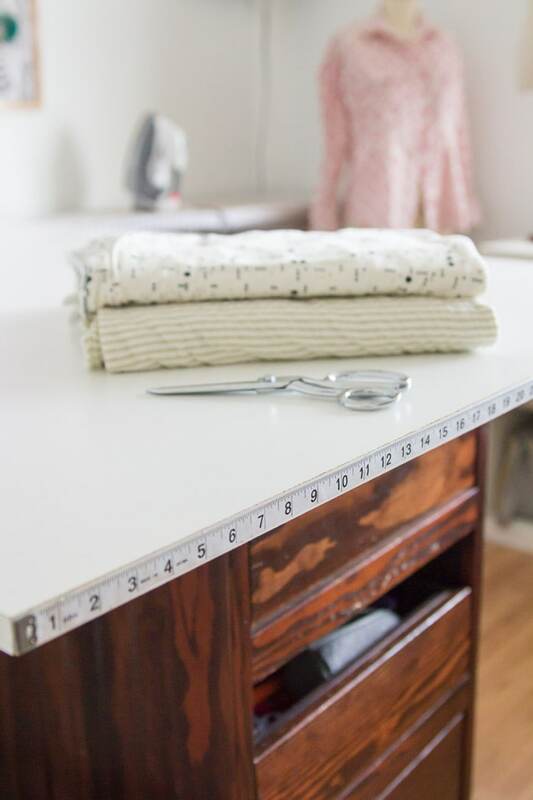 Glue a measuring tape to the edge of your cutting table – this is mine, and I use this all the time! I just hot glued it right on. 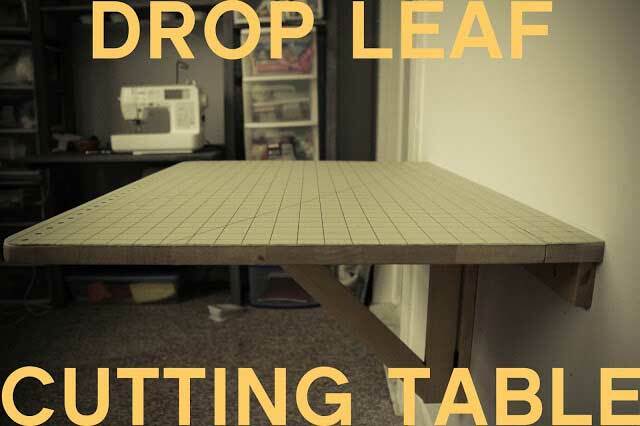 Don’t have room for a big cutting table? What about a Murphy style one that folds up onto the wall? Or maybe just a drop down cutting table. Stumped with fabric storage? Here are a few unconventional ideas. I’ve gotten a new desk chair, but I still manage scraps this way. 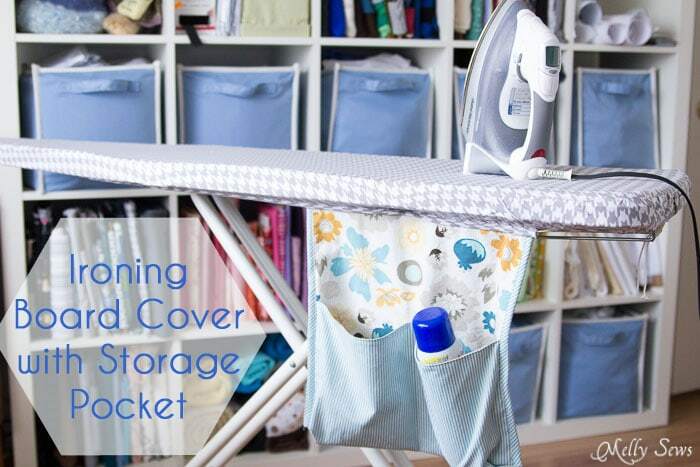 Add some storage to your ironing board like I did. Or keep your iron right by your machine like this. 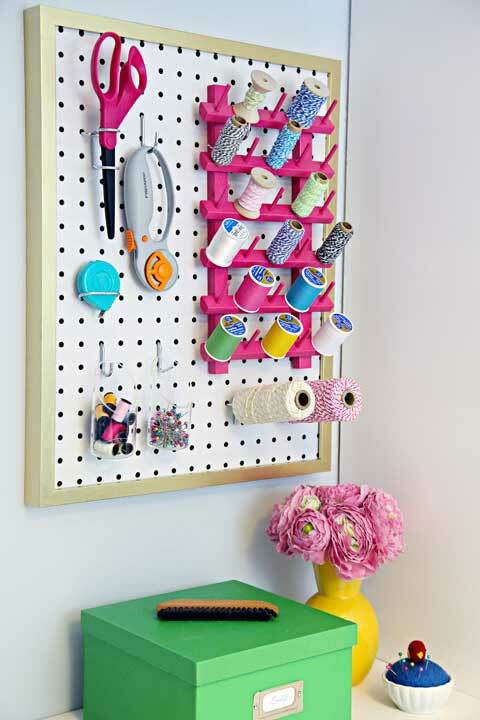 Pegboard is easy to paint and can be used in many different ways in the sewing room. Painted a bright color it’s decorative and functional. If you can’t do a big board, a small framed one works just as well. 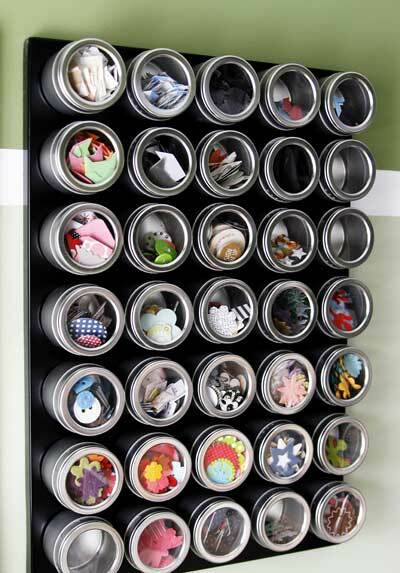 Use a magnet board and metal containers to store buttons, snaps and other small notions. 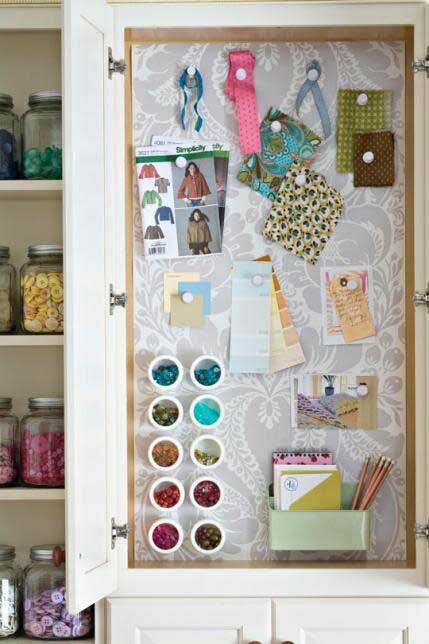 Add magnet board to a door with fabric over it for pretty storage. Magnet strips are also good to hold bobbins. 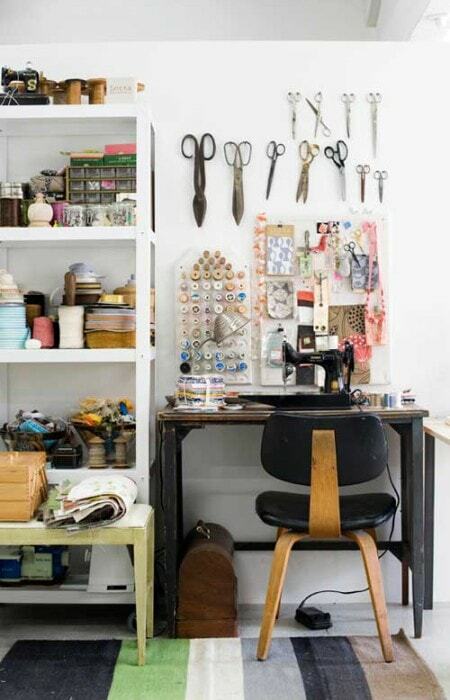 Or use kitchen knife holders to hold scissors and tins like I do in my studio. 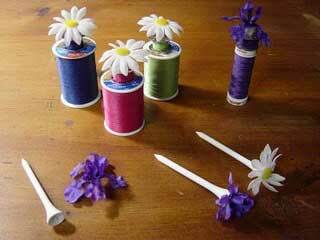 Golf tees can be used to keep same colored bobbins and thread together. 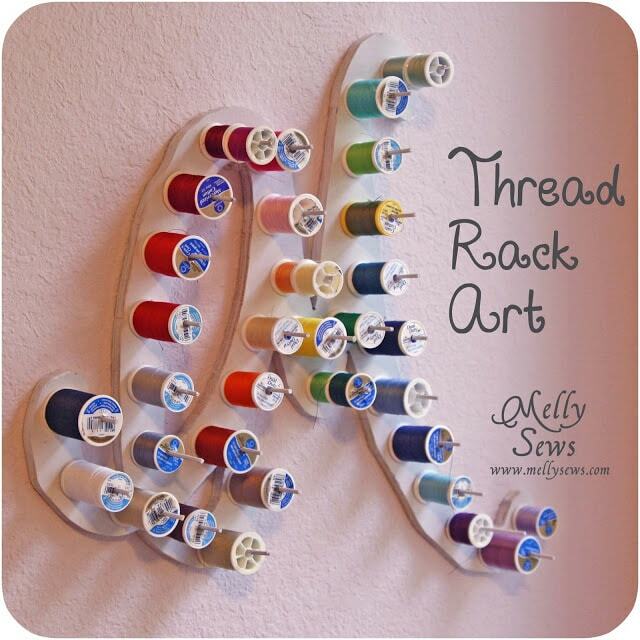 Or make a framed thread rack. 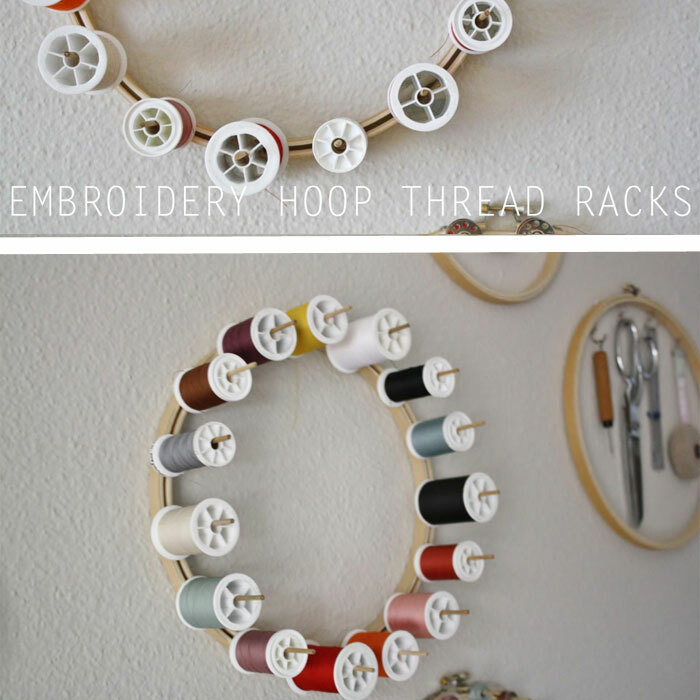 Embroidery hoops also lend themselves to thread storage. 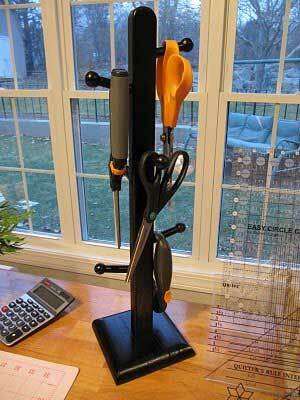 Or use a scroll saw and really personalize your thread rack, like mine. A mug tree can be a great way to store scissors. 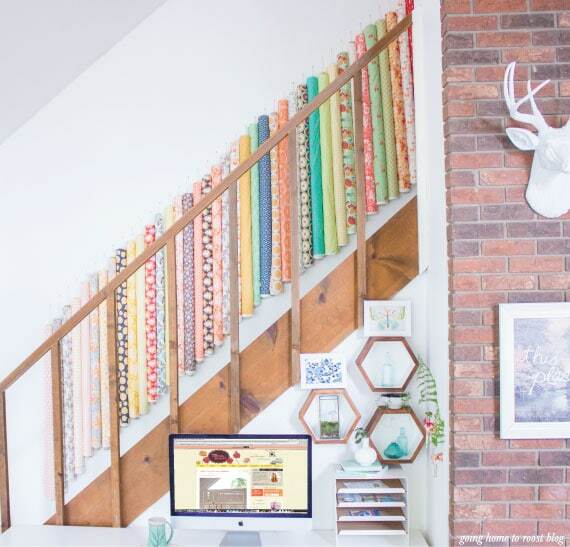 Or hang them on the wall – they can be functional art. This is why pegboard and magnet boards are so handy. 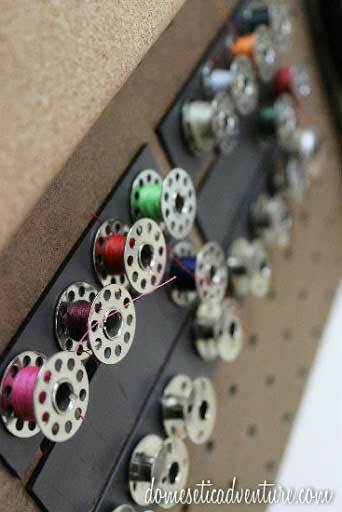 I use curtain wire and clips to store my buttons on the wall for easy browsing. And a corkboard showcases my zippers. Hope you are inspired by some of these! There are some great ideas here. 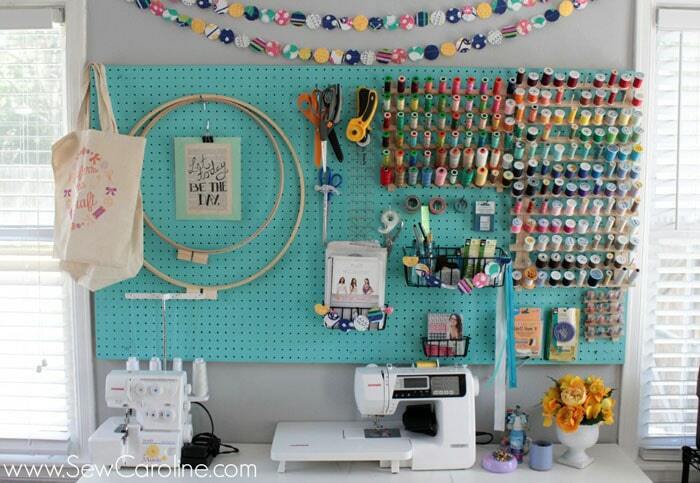 I’ve got to get a pegboard & get organized with it. Thanks for putting some great ideas together. Love the small ironing table next to the machine. This could not be more perfectly timed! Thanks for all the great ideas and for including my trash can! I am going to inlay a meter stick into the top on one side of my cutting table – always wanted that! Super! Pinned quite a few of those so I won’t forget them. 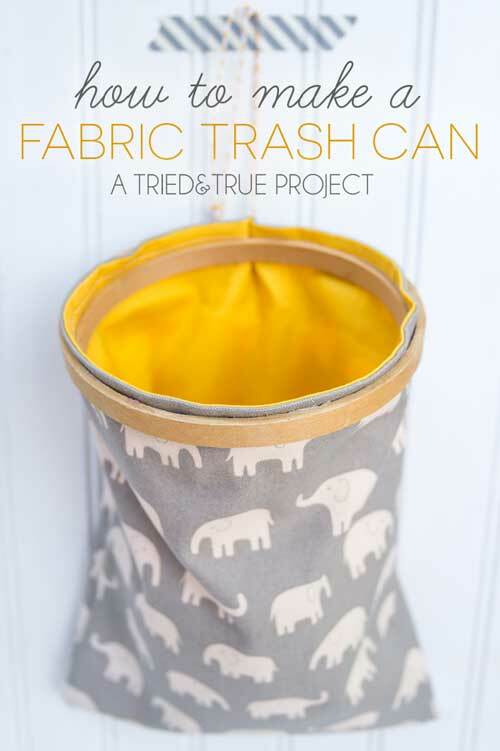 Can do the hanging files of fabric in my plastic portable file that now houses a lot of JUNK! 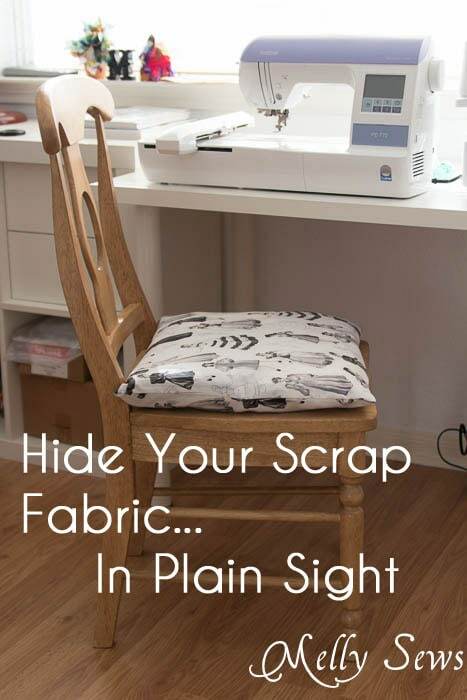 And I love the seat cushion of scraps. BRILLIANT! Love so many of these! My daughter has just started sewing some & I can’t wait to share these with her! Some really cute designs. I made a little ironing table out of a wooden folding TV tray. I use it all the time. I put a layer of the stuff I use to make pot holders. Can’t remember what its called. 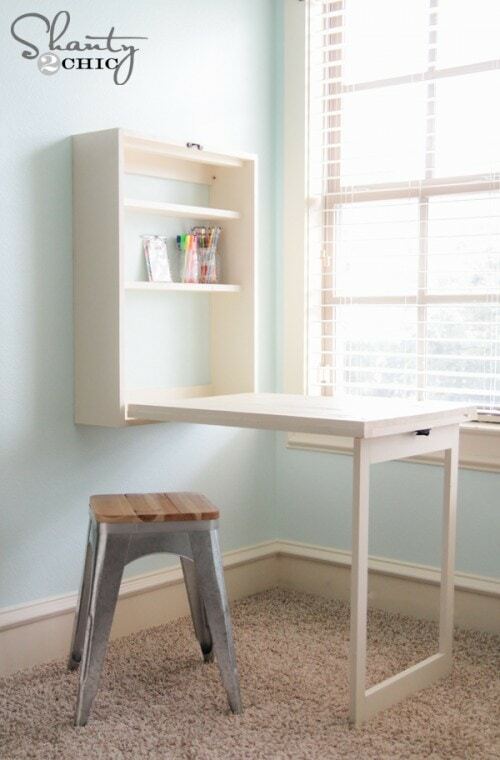 I want a Murphy table.. or a bigger craft room. Or both! I love storing my supplies where I can see them. For me out of site is out of mind. But I have to say that thread should be stored in a cool dark place. Thread does have a shelf life. It loses it’s strength as it gets old. Light especially sunlight ages it faster. This is even more so with embroidery thread. It will break while embroidering . I saw on another blog quite sometime ago to put little pony tail holders on bobbins. I find them at WalMart they call them hair elastics. They are really cheap. They pretty much are perfect to cover a bobbin. I put my bobbins in bobbin box but still loose threads would be everywhere. My apologies for not remembering where I saw that. 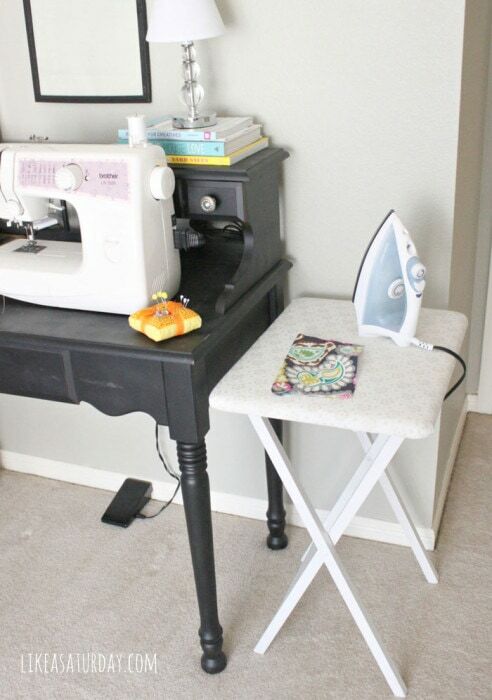 When making the little ironing table you should use cotton batting. The polyester has a tendency to melt. 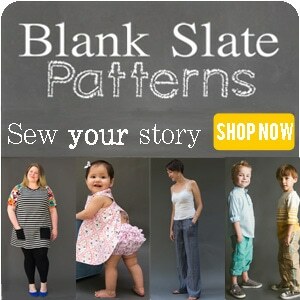 When I make mine I’m going to put a thick layer of cotton batting then a layer cotton fabric. I’ve been sewing for decades and had sewing rooms in multiple houses as I’ve moved around the world. 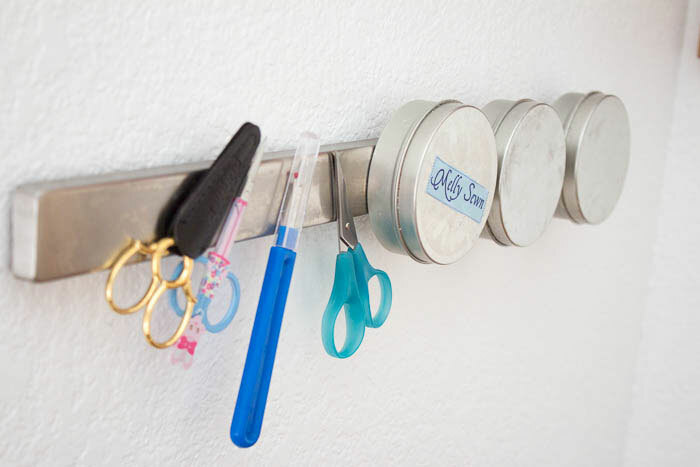 This webpage has several great ideas for storing sewing items. REALLY GREAT IDEAS! 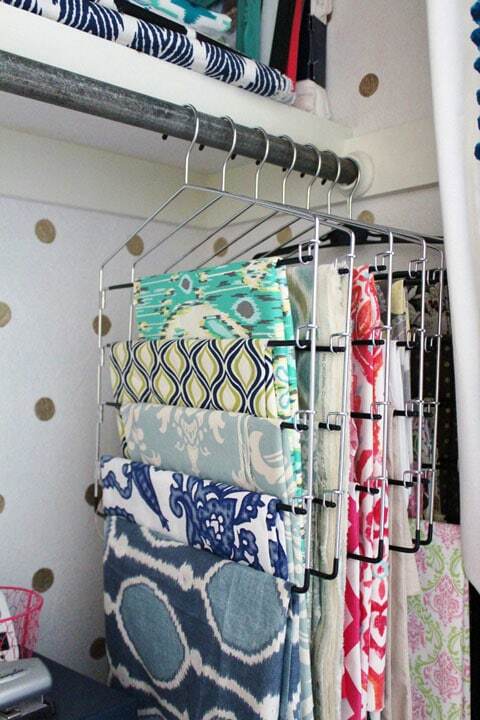 These are some of the best ideas to solve problematic storage issues I’ve seen. They work in a large, lavish room or a small corner. Thanks for sharing! Great ideas for a small space. I just need to get started on creating mine. Loved the golf tees! I was looking at Lowe’s for something to use but like this better! These are excellent ideas! I’ve got to try some of them since my stuff is so cluttered. 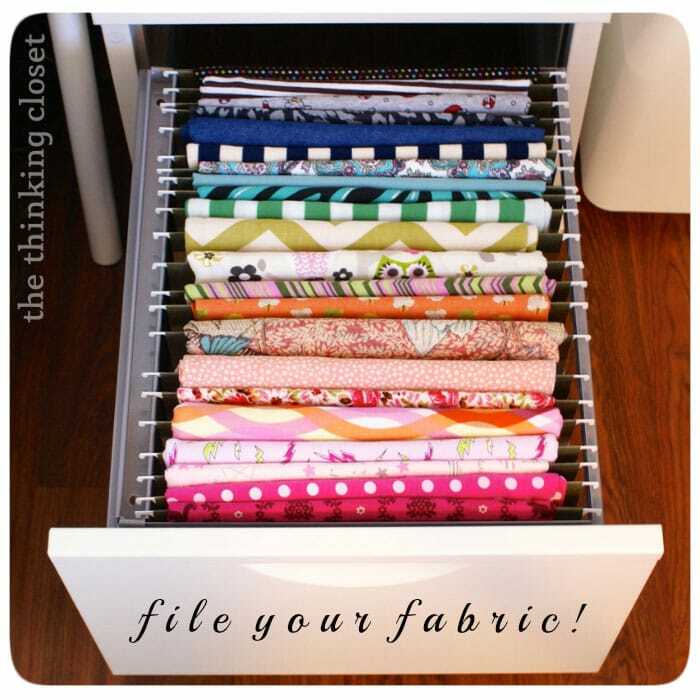 I loved the hanging file fabric storage. this is so wonderful! I am just learning to sew and at the age 59 going to be a bit overwhelming, I love the ideas you guys are showing and the pics are awesome too. I have a bedroom that I call the craft room. 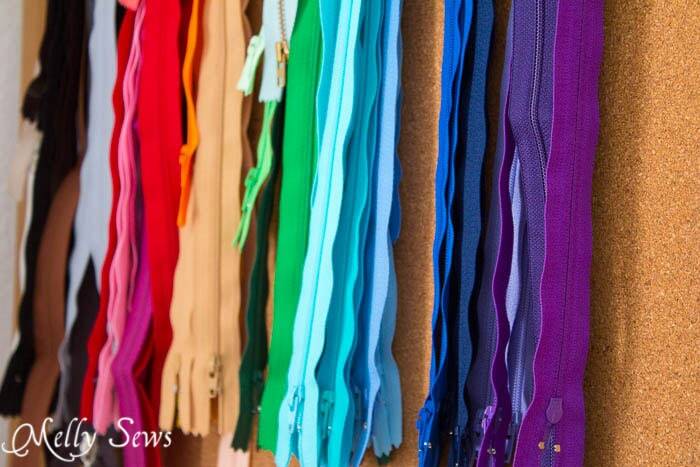 wanting to sew will be a dream come true. I don’t know how to open pinterest for directions though. ugh.. I can pin, send, like etc., just don’t know how to get those ideas. darn it. no pun intended! hehe sewing term? (darn) tried mellysews pinterest also. well thank you all so very much I will keep looking at pictures and try to get the hang of it and learn to sew! Denise, you are never too old to feel young again. I am 71 and taught myself to sew when I was in my 60’s. I used old jeans that people no longer wanted. I cut and ripped them into shapes and sewed…figuring if I messed up I was not out a lot of material supply money. Those jean scrap items grew as my skills grew. I still LOVE turning old jeans into coats that I fray and personalize for family and friends. Learning how to read and understand patterns still gives me problems so most of what I make are my own designs. My whole attitude is that if I made a mistake it is a new design element and I meant it that way LOL. I do not know what area of the world you live in but I would be glad to share anything I know. I would attach a picture of some of the coats I make to give you ideas but I do not know how to do this. YOU have picked a GREAT website to follow. 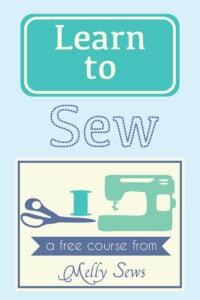 I absolutely LOVE Melly Sews as she explains in the way that is understandable to us who have not sewed all our lives. Her you tube videos have helped me tremendously. I am also new to technology so the computer can baffle me at times but like I started this post….YOU are NEVER too OLD to FEEL YOUNG AGAIN. Mellly keeps me thinking young and her energy helps me pull through the projects that I try. Don’t give up Denise. For thread storage I use a jewelry bag (similar to a pocket bag for shoes) it is clear, has some zippers, pockets on both sides, that i can hang anywhere. 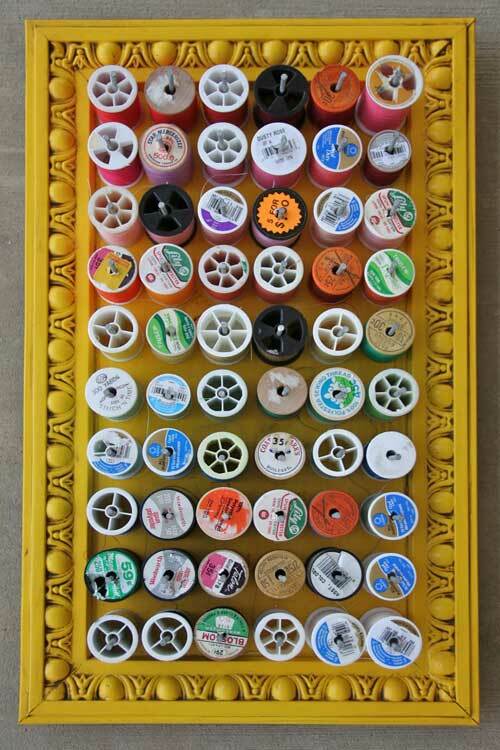 The larger pockets are best, i can store 2 spools in each pocket, frontand back. With the zippers, i can fold for travel or to store anywhere. Works great for me, hanging behind my door. Purchased mine at TJ Max. Also when my machine started vibrating, i tried a mouse pad, it worked ok, then i found just a rubber mat, thin and it elimates some of the movement, or double layers of shelf liners. Thanks for introducing me back to sewing. My girlfriend wants to get me back to crafts shows. Now thanks to you have the ideas that are different and fresh to start with. I made the pegboard for my thread holder but when I remove one cone several others fall off. I made the posts longer for the cones and even angled the board to no avail. Can you help? I keep all my Tictac boxes. They’re perfect for stashing pins, buttons, needles, you can store rolls of lace or ribbon inside them to dispense from the top, and they look nice standing together on a shelf.